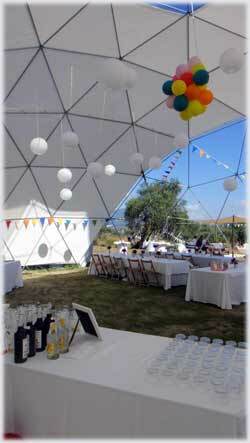 The geodesic dome is a highly attractive shape which people are naturally drawn to. They stand out impressively at any event and provide the largest possible amount of open floor space without inconvenient internal supports or walls. Geodesic dome structures, invented by Water Bauersfeld after WW1 and famously developed by R. Buckminster Fuller, have been called “The strongest, lightest, and most efficient means of enclosing space yet devised by man,” by the American Institute of Architects. Geodesic domes are exceptionally useful in windy environments in comparison to other canvas covered alternatives. When set up properly for this type of environment domes provide great shelter with good ventilation. Geodesic domes can be situated on most types of terrain, including sand, snow, earth, grass or concrete. We can deliver & install if required. We are very serious about our work. Our geodesic domes can be supplied with a Spanish Informe-peritacion (Architects report) stamped by the College Of Architects. Which states the official strength and stress ratings of the structure. Wind and snow resistance information is also included in this fully comprehensive report. This certification of our domes allows them to be errected in public places or as living spaces, with health and safety and insurance aspects provided for. The list could go on and on, limited only by our imaginations. Domes are extremely versatile constructions. They allow a building of maximum space/ covering using the minimum of materials according to their inventor Buckminster Fuller. 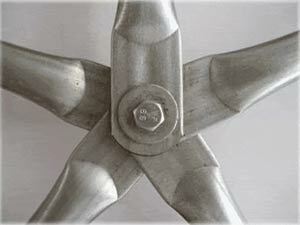 The poles for all domes are round in cross section, made from 30mm galvanized (weather & rust proof) steel. The hubs we use on all of our domes are designed primarily for strength and longevity. Here you can see a close up of our design. The rounded shape of the flattened part of the pole is designed to spread the load evenly over the pole and hub, this gives our domes a tremendous increase in strength over a straight edged press design. When choosing your dome you need to consider 3 main things, diameter, height and frequency.